Jeffrey Ross Lifschultz (born September 13, 1965) is an American stand-up comedian, writer, and actor. His skill in doing high-profile celebrity roasts and his appearances in Comedy Central's Roasts have led him to be dubbed "The Roastmaster General." He has appeared in various film, television, and cartoon projects. He has made appearances at events for U.S. soldiers and directed a documentary film covering his experiences touring U.S. bases in Iraq. Jeffrey Ross Lifschultz was born and raised to a Jewish family in Springfield, New Jersey, where he attended Jonathan Dayton High School. His mother died from leukemia when he was 14 years old. His father owned and ran a banquet facility; he died when Ross was 19 years old. Ross studied karate at an early age, attaining the level of black belt when he was 10 years old. Ross and his sister attended Boston University; he graduated from its College of Communication. In a 2008 interview for the student-run BUTV10 program Full Circle, Ross mentioned that during his college years he was the director at BU's WTBU and worked at the local NPR affiliate. His appearance during a 1996 Monday night open mic night in New York City at the now closed Greenwich Village location of the Boston Comedy Club (coordinated by Tracey Metzger) appears in the movie Celtic Pride. Ross credits a particular joke made at the expense of Bea Arthur and Sandra Bernhardt at the Friars Club roast of Jerry Stiller in 1999 for creating his roasting career. Ross was both the show's producer and a guest. It was not the joke itself, which he claims was not that funny, but Arthur's wordless reaction to it. He said "I felt like she [Bea Arthur] put me on the map because everywhere I went people were quoting this joke to me." On September 1, 2009, Ross was the first guest on the debut episode of the WTF with Marc Maron podcast. On April 6, 2017, Ross was the guest on the 800th episode. In 2015, Ross starred in the Comedy Central TV special Jeff Ross Roasts Criminals: Live from Brazos County Jail, where he performed stand-up comedy for male and female convicts in Brazos County, Texas. Ross competed on the seventh season of Dancing with the Stars. He was partnered with Edyta Śliwińska. During rehearsal for their first dance, Śliwińska accidentally poked Ross in the eye, causing a scratched cornea. Against doctor's advice, Ross continued the competition. They performed the cha-cha-cha to "Play That Funky Music", but were the first couple to be eliminated. They later performed a quickstep to "I Get a Kick out of You" as an encore for the elimination show. 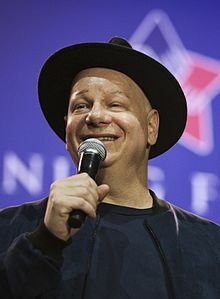 On August 14, 2012, Jeff Ross debuted his weekly Comedy Central show The Burn with Jeff Ross, which aired for two seasons. He appears in The Aristocrats. He appeared in the third tournament of Celebrity Poker, but lost in his first match. In 2018 he toured with Dave Attell on the Bumping Mics Tour. Ross's stand-up has been featured in Comedy Central's animated series Shorties Watchin' Shorties. He provided the voice for the beagle Buddy in the MTV2 Sic'emation animated satire program that he created, Where My Dogs At?. An animated version of Jeff Ross appears in Batman: The Brave and the Bold in the opening to the episode "Crisis: 22,300 Miles Above Earth" voiced by Ross himself. He distracts the Joker and the other villains at Joker's celebrity roast in order for Batman to escape being literally roasted alive. When the Joker tries to escape, Ross stops him. When he subsequently suggests that he could be a full-time crime-fighter, Batman dryly advises he should just stick to comedy. Ross played a dramatic role on CBS's CSI. He has also acted in HBO's Six Feet Under, Crashing, Comedy Central's The Sarah Silverman Program, and Showtime's Weeds. He has appeared as a regular cast member in Nick Cannon's Wild 'n Out on MTV. In film, he has appeared in Stuck on You. In Future-Worm! He voiced Mr. Bleaker, a teacher who formerly was in a band called Titanium White. Ross' sole directing credit, Patriot Act: A Jeffrey Ross Home Movie (2005), received the Best Feature Film Award at the Montreal Comedy Festival. The documentary is about Ross' life-changing experience entertaining U.S. troops stationed around Iraq. It features fellow comedians/comic actors Drew Carey, Blake Clark and Kathy Kinney. Ross is the author of I Only Roast the Ones I Love: Busting Balls Without Burning Bridges, a book released September 15, 2009. It recounts his rise to stardom and, includes tips on writing roast jokes and has ideas on how to put on a roast. Ross is a Democrat. He visited the protesters of the Occupy movement in Los Angeles to support their cause and took the microphone to speak publicly to the crowd. He combined the movement's message with his comedy. ^ Joe Rogan Experience. Joe Rogan Experience #686 - Jeff Ross August 20, 2015. ^ Jeffrey Ross: No Offense. Comedy Central. August 22, 2008. ^ a b c Ross, Jeff (September 13, 2016). "Having Thick Skin Is A 'Survival Technique,' Says Comic Jeff Ross". Fresh Air. Interviewed by interview with Terri Gross. NPR. Retrieved September 15, 2016. ^ Ross, Jeff (December 6, 2010). "December 6, 2010 podcast". The Adam Carolla Podcast. ^ "Joe Rogan Experience #686 - Jeff Ross". YouTube. The Joe Rogan Experience. ^ Buckman, Adam (April 27, 2009). "In his own words: Comedian Jeffrey Ross on the Bea Arthur joke that made his career". TV Howl. Retrieved September 14, 2016. ^ "The unique Jeff Ross Roasts Criminals plants feet in two camps, excels in neither". avclub.com. ^ "Jeff Ross & Dave Attell « Joe Rogan (Podcast Site)". Jeff Ross & Dave Attell « Joe Rogan (Podcast Site). Retrieved 2018-11-28. ^ "Jeffrey Ross At Occupy LA: Part Stand Up, Part Soap Box". The Huffington Post. October 21, 2011. ^ Romero, Dennis (October 18, 2011) "Jeffrey Ross, Comedian, to 'Roast' Occupy L.A. at City Hall Tomorrow". LA Weekly. Wikimedia Commons has media related to Jeffrey Ross. This page was last edited on 16 April 2019, at 11:14 (UTC).